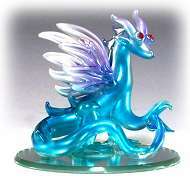 Opalescent Purple Winged Dragon is poised to attack any intruder. 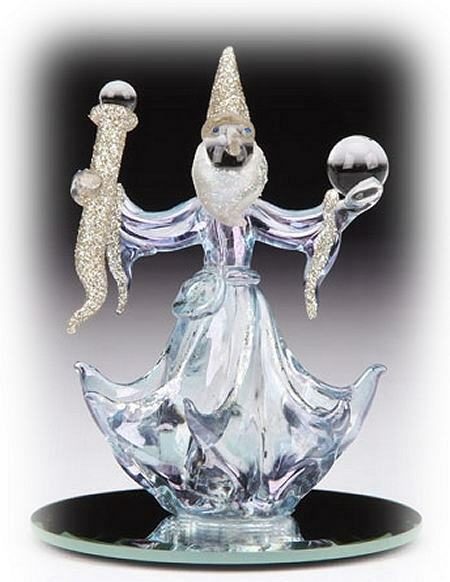 This hand spun glass figurine can be illuminated with an LED light base and is a great gift or party favor. Gorgeous Sapphire Dragon with purple tinged glitter wings is set atop an oval beveled mirror base. He has red crystal eyes and gold accented horns. Feng Shui accessory combining the beneficial properties of the ancient dragon symbol with the Chi energy of mirror and glass. 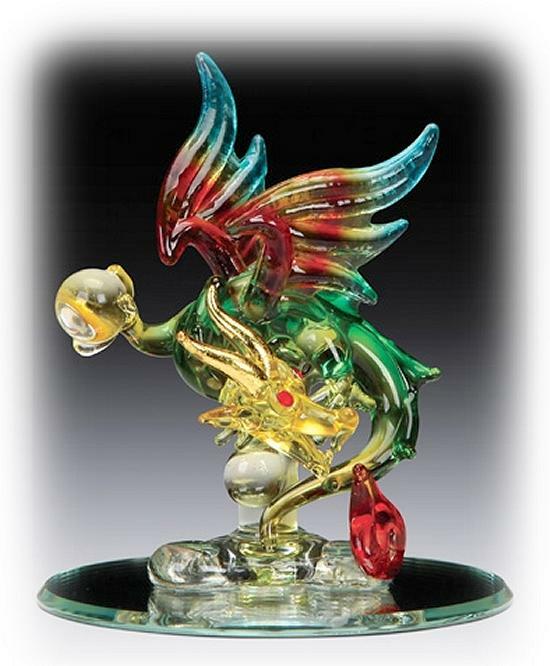 Multicolored winged Dragon with crystal ball is set on a beveled round mirror base which can be placed over an LED light base. He has red crystal eyes, a yellow head, green body and rainbow wings with gold trimmed horns and fangs. 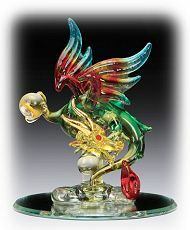 Each hand made spun glass dragon figurine comes packed in a glossy gift box. 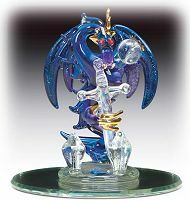 This spun glass Mystic Blue Dragon with sparkle wings and ruby crystal eyes has gold accented horns, ears and claws and stands next to two crystals. He holds a large rainbow glass sword in one hand and a crystal Ball in the other. 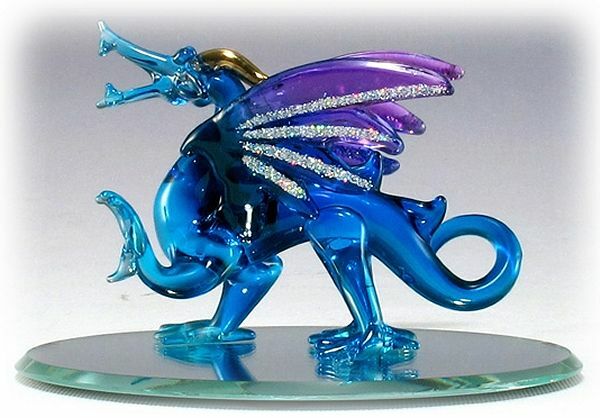 This Dragon figurine is set on a beveled round mirror base with a clear center so it can be set on a lighted base. 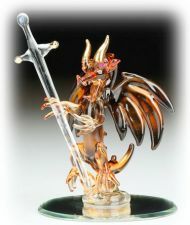 This stunning glass Tiger Dragon with sword has gold accented horns and crystal eyes. He holds a clear glass sword with gold tipped handle and stands on a beveled mirror base that can be illuminated with an LED light base. 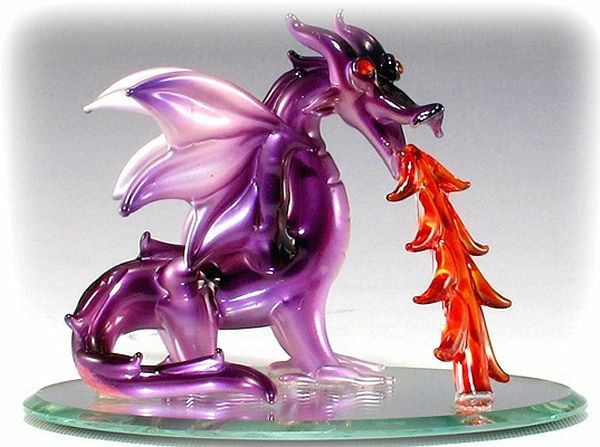 Eye catching iridescent Purple Fire Dragon has opalescent colors in purple hues as he breathes out fiery flames. He has red crystal eyes and is set on a beveled oval mirror base. 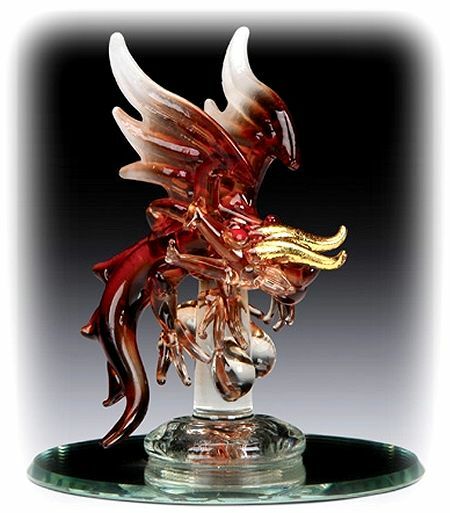 Glass Chinese Dragon sculpture in sunset rainbow colors has gold accented horns and ruby crystal eyes and is set on a beveled oval mirror base. The Chinese Dragon is a legendary symbol for strength, power, and fearlessness. Luminous Emerald Dragon with sparkling green crystal wings is set atop an oval beveled mirror base. He has red crystal eyes and gold accented wings. This Feng Shui accessory combines the beneficial properties of the ancient dragon symbol with the Chi energy of mirror and glass. Charming Aqua Winged Dragon in iridescent sky blue with purple accented wings and horns. He has red crystal eyes and a mischievous devil's tail set on a round beveled mirror base. A dazzling opalescent Amber Winged Glass Dragon with gold trimmed horn and claws is poised and ready for attack. He is set on a beveled round mirror base which can be placed over an LED light base for added effect and comes in a glossy gift box. Spun glass Frosted Merlin Wizard with magic staff or wand and crystal ball on a round glass mirror base. This hand made spun glass figurine is a perfect gift or party favor packaged in a glossy gift box. 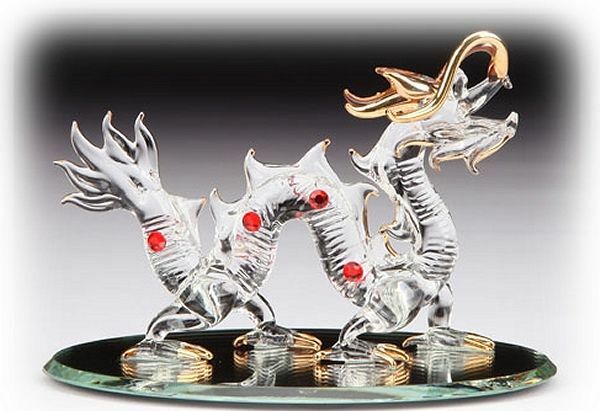 Beautiful clear glass Chinese Good Luck Dragon with ruby crystal accents and gold trimmed horns, back and claws. He stands on an oval beveled mirror base which can be placed over an LED light base for added effect. Feng Shui accessory combining the beneficial properties of the ancient dragon symbol with the Chi energy of mirror and glass.